The Energy Advice in Detail publication provides an annual analysis of the energy issues on which consumers in Scotland seek advice. 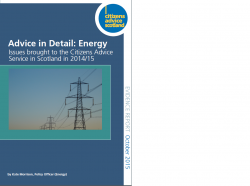 The Citizens Advice Service in Scotland advised on a total of 28,000 energy issues in 2014/15, an increase of a third from the previous year. Of this figure, clients took 22,051 energy issues to their local CAB, contacted the Citizens Advice Consumer Service (CACS or “the helpline”) with a total of 4,799 energy issues and the Extra Help Unit provided specialist help and advice to 1,150 vulnerable consumers. From the body of evidence gathered in this report, CAS highlights ten key areas where it appears that the energy market is not serving consumers effectively, or where it is clear additional support is required to ensure that consumers are not disadvantaged by an inability to engage with the market and to heat their home.